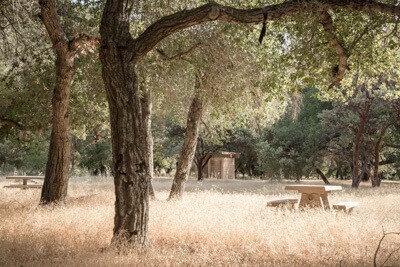 Red Rock Day Use Area includes 28 sites, each with a picnic table, pedestal grill and parking spur. There are three vault toilet buildings for a total of six seats. The road system and parking spurs are paved. Water is not provided, although there are garbage bins. The Santa Ynez River can be accessed from the site. This area may remain closed all summer if not needed.